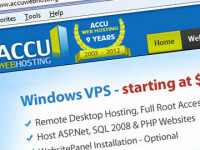 AccuWebHosting recently released a 20% OFF discount! Grab the opportunity to save 20% OFF on any Windows SDD VPS plan, hurry and take advantage of this promo! Use the AccuWebHosting coupon below.